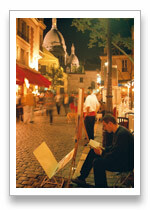 Montmartre and art are closely linked together. 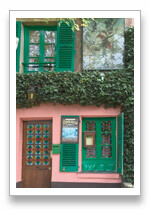 By the end of the 19th century the area was a mecca for artists, writers and poets and their disciples, who gathered to sample the bordellos, cabarets, revues and other exotica which made Montmartre�s reputation as a place of depravity in the eyes of the city�s more sober citizens. Many of the artists and writers have left the area since long time ago and the lively night life does not have the same charm. However, the hill of Montmartre (the Butte) still has its physical charms and the village atmosphere remains remarkably intact. Many, many tourists ascend the hill, most if the them gathering in the most spacious parts, particularly where quick portrait artists and souvenir sellers thrive, as in the old village square, Place du Tertre. Elsewhere there are tiny, exquisite squares, winding streets, small terraces, long stairways and the famous vineyard of Montmartre where the few grapes are harvested in an atmosphere if revelry in early autumn. 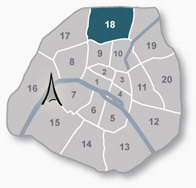 Spectacular views of the city are offered from various points, most especially from the monumental Sacr�-Coeur.